Troon North - as Good as it Gets!!! 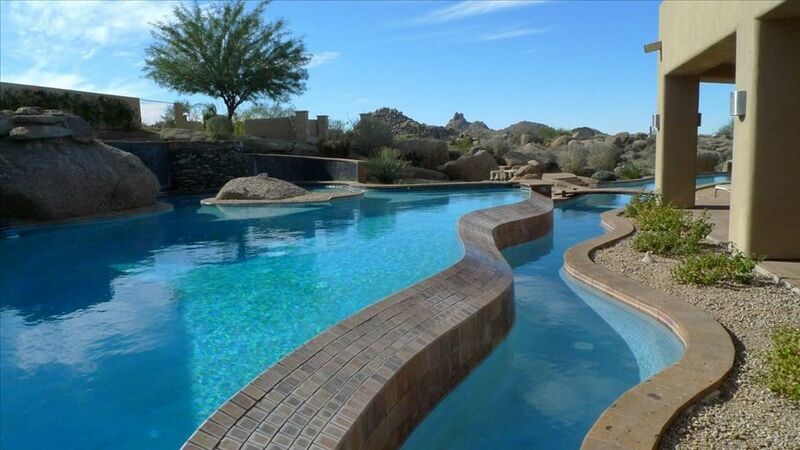 This Scottsdale Arizona home is located in a gated community. The nearest and main intersection is Dynamite & Pima, just 2 minutes from Troon North Golf Resort. The home is approximately 5,000 square feet and can be your home away from home. The home is professionally decorated, cozy and very comfortable. The style of our home is open concept for kitchen and family room and is very comfortable. Our home is conveniently located only minutes from cultural & social centers of Scottsdale and Phoenix. Shopping, restaurants and banking are just moments from your doorstep. You can enjoy the best burger! Just around the corner is Bluburger…the best burgers my family and friends have ever eaten. My wife doesn't eat red meat and she swears that their turkey burger is by far the most awesome she’s ever eaten. It's the first meal my daughter wants to have when we land and the last before we leave. The master bedroom is spacious and has a very large ensuite with double vanities, Jacuzzi tub, shower for two and a large walk-in closet. Plenty of room for guests with a queen size beds and king in the master . Features include rooms with 10 - 14 foot ceilings, all new appliances. All kitchenware and mini appliances and pans you will ever require. Enjoy a book while relaxing on the private patio in the backyard. The pool overlooks the desert landscape with a magnificent view of Pinancle Peak mountain. The back yard pool is one of the most magnificant pool I have ever seen. What a perfect way to relax with family and friends. You can take in an Arizona Cardinals, Phoenix Suns, Arizona Diamond Backs and Phoenix Coyotes game all within a 30 - 40 minute drive. Desert jeep rides, horseback riding, and 4 huge and unique shopping malls. GOLF, you ask? Arizona has more golf courses then any state in the USA. There are at least five dozen within a 30 minute drive. My two favorite are the Boulders and Troon North these are both just minutes away. There is so much for everybody to do and one week just isn't enough time, but it will be one of the best weeks you will ever have. Did I mention there are 2 casino's 20 minutes away...and Vegas is a 4 hour drive through Hoover damn...wow what a drive!!! Or take an hour drive to the most amazing city of Sedona and experience the red rock city. You're right WE LOVE IT THERE!!! Keywords: bungalow, gated community, Troon North, golf, spa, pinnacle peak, house, home. 4 bedroom, four bedroom. Great gated community, and the pool is the most amazing pool we have ever seen. It takes 7 pumps to run the water falls the spa the sprinklers, the rock falls and to keep the pool clean. It is right next door to the Troon Golf Course, one of the most senic golf courses you can imagine. The community also has a park with a couple of tennis courts and a basketball court, just a short drive near Pima Rd. The nights are magnificant, you can sit by the fire pit and roast marshmellows and just enjoy the views and the quiet time with your family and friends. Lots of time spent just plain enjoying the sunny, warm weather that the area is famous for while it's a deep freeze in Toronto. All with endless places to shop and eat out. There are so many things to do so close by, you never run out of options. in the garage...the community does not allow out door over night parking. yes but please use the washer and dryer to leave them cleaned up before you leave. As big as it gets, gas & electric oven. Some books, feel free to browse read and leave a book you have read. 2, you will probably have to fill up the tires with air. pump is in the garage. yes, about a mile drive away. has a stair buddy from the garage. Nice's pool I have ever seen!!! Not heated , but the hot tub is heated. We have back yard out door speakers, and the bar in the family room has a window open to the back yard covered area for serving drinks. Great for parties and entertaining. This house was perfect for our family for spring break! Ameninties galore! Pool was awesome! Sunsets over Phoenix spectacular! Had 11 family members staying at David’s property for spring break. The layout of the house was great. Loved having a big kitchen that everyone could be in and the dining room table was big enough for all of us to sit at. The pool was chilly but to be expected this time of year. Would be fabulous for a summer vacation. David was responsive to any questions we had. Would go back again. Debbie it was a pleasure to meet you and Kevin and your family. Glad you enjoyed the house and had great weather. You're welcome back anytime. Thanks for leaving our home nicer than when you arrived!!! The home was beautiful, very clean and comfortable. David was always available if we had questions and a wonderful host. The pool was amazing. Glad you and your family enjoyed our home and had a great vacation. Hope you come back again next year...now that you know how everything works. Have a great day. Ciao!!! My husband and I and a few friends were looking for a 5 star resort to stay. We saw the four seasons which is beautiful but for the equivalent would have been more than double. We then decided to search VRBO and found this magnificent breath taking home 3 minutes from the four seasons. This home had everything and more. The pool was fabulous with a 100 foot lazy river and a jacuzzi spa. The rooms were all spacious with own washrooms. The kitchen is a chefs dream it had everything we needed to entertain and cook for ourselves. The house was spotless and equipped with lots of towels hair blowers. We didn't need anything. The owners left a wine bottle for us to enjoy and said doesn't matter whatever you need give us a call. they were at tentative to our needs and any questions we had and replied ImmediTely. Definitely coming back next yeAr loved the home the Area and all the restaurants recommended. Thank you for taking the time to write such a great review. We are happy that you and your friends enjoyed our home and surrounding community. Hope you had a safe flight home. This home actually looked better in person than in the pictures. The beautiful and spacious rooms were tastefully decorated and the home was equipped with all the utilities that we would need. The kitchen was fully stocked with utensils, blender, keurig coffee maker, and a patio barbecue. The pool is spectacular and the evening sunsets by the fire pit are beautiful. The home is closely situated to all essentials and next to Troon North golf course and pinnacle peak, which we hiked daily. The restaurants that you recommended were greatly appreciated and enjoyed. Thank you for the use of your beautiful home and attending to any questions we had so promptly. Thanks KM for taking the time to write a review. Glad you guys had a great stay. Talk to you soon. Look forward to seeing you next year. I want to stay here again and again and again!!! Beauty, breathtaking views, luscious landscaping, fantastic gourmet kitchen, super close to some of the best cuisine Scottsdale has to offer, a sparkling blue pool, word-class sunsets and caring and prompt owners. It doesn't get any better than this! We lived like kings and queens for our stay and were treated like royalty. The property is spacious, clean and bright. You will never want to leave. This is a must for big family get-togethers or company groups. We will definitely be back. Thank you David and family for sharing this beautiful home to us. Our best VRBO experience ever. Thank you Kim for writing such a glowing review. Thank you for taking the time to post your review. Hope to see you again next year.